Next year your kids will have the opportunity to experience ancient Rome first-hand, following in the footsteps of Paul. Watch your kids elbow through a crowded Roman marketplace…visit with the Apostle Paul…and gasp as a thief is wrestled to the ground. They’ll tiptoe past Roman guards as they inch their way to a hidden cave—where first-century Christians eagerly await their arrival! In Rome VBS 2017 children will explore ancient Rome through creating crafts at the marketplace and playing active games. When children visit the apostle Paul in prison each day, he teaches about God’s love for them. By the end of their Roman adventures, children have experienced ancient Roman culture, as well as discovered God’s love for them. Just like Egypt VBS 2016 , Rome VBS is packed full of Bible truths that are easy for kids to remember. Kids will experience each Bible Point in an engaging activity, and be able to take home the key verse on a Bible Memory Maker. 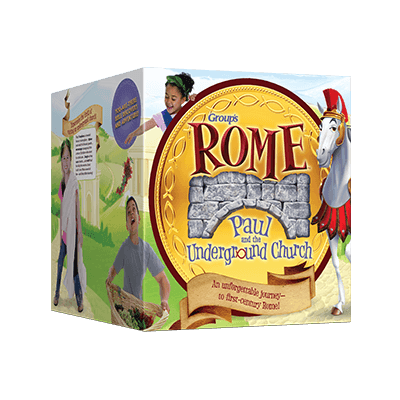 To learn more about Rome VBS 2017, we suggest pre-ordering a starter kit. With the starter kit you’ll get everything you need to start planning, plus fun samples and leader resources.